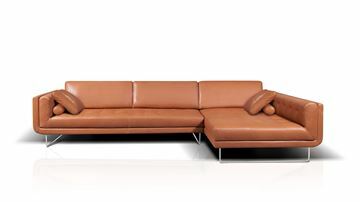 The Saggezza Leather Sectional with left end open bumper by Natuzzi. Features clean lines with balanced symmetry. Enjoy the plush comfort seating of the sofa side, or put your legs up and completely stretch out on either side of the corner. And bumper end designs in sectionals make a wonderfully open look in a room, and also for perfect room dividers and casual conversational settings. Aside from the modern and minimalist looks, you'll love the tremendous comfort. Thanks to rounded edges added to plush arm, seat, and back cushions, you'll love every minute of time spent relaxing in this Saggezza Sofa Chaise design. The two top cushions closest to the square corner are attached to the frame and do not adjust vertically. 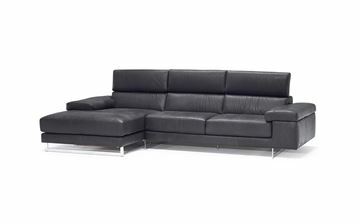 The Saggezza Leather Sectional with right end open bumper by Natuzzi. Features clean lines with balanced symmetry. Enjoy the plush comfort seating of the sofa side, or put your legs up and completely stretch out on either side of the corner. And bumper end designs in sectionals make a wonderfully open look in a room, and also for perfect room dividers and casual conversational settings. Aside from the modern and minimalist looks, you'll love the tremendous comfort. Thanks to rounded edges added to plush arm, seat, and back cushions, you'll love every minute of time spent relaxing in this Saggezza Sofa Chaise design. The two top cushions closest to the square corner are attached to the frame and do not adjust vertically. 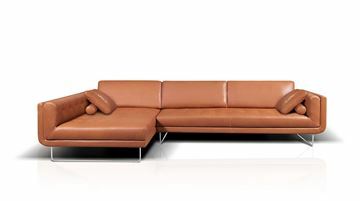 The Saggezza Leather Sofa Chaise Left by Natuzzi features clean lines with balanced symmetry. Enjoy the plush comfort seating of the sofa side, or put your legs up and completely stretch out on the chaise lounge side. Aside from the modern and minimalist looks, you'll love the tremendous comfort. Thanks to rounded edges added to plush arm, seat, and back cushions, you'll love every minute of time spent relaxing in this Saggezza Sofa Chaise design. 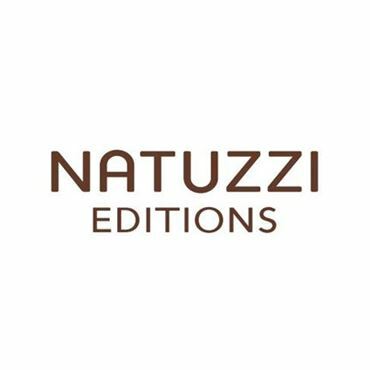 The Saggezza Leather Sofa Chaise Right by Natuzzi features clean lines with balanced symmetry. Enjoy the plush comfort seating of the sofa side, or put your legs up and completely stretch out on the chaise lounge side. Aside from the modern and minimalist looks, you'll love the tremendous comfort. Thanks to rounded edges added to plush arm, seat, and back cushions, you'll love every minute of time spent relaxing in this Saggezza Sofa Chaise design. 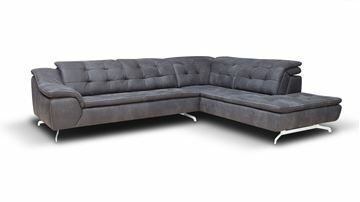 The Arabella Sectional by Lazar, with a beautiful open bumper end on the left side. 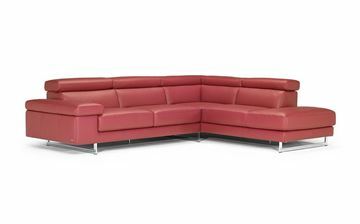 The generous curves and mid height back are exceptionally comfortable for lounging and conversation. Although we show the Arabella as a three piece sectional with two accent pillows, other configurations are available. Please contact us for two-tone pricing using more than one fabric, or to explore a different configuration. Two accent pillows are included with this configuration as shown. 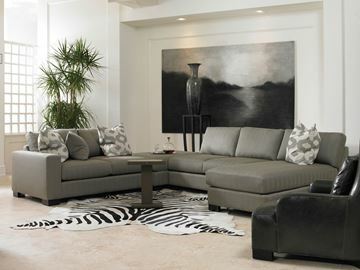 The Arabella Sectional by Lazar, with a beautiful open bumper end on the right side. 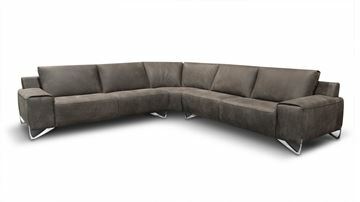 The generous curves and mid height back are exceptionally comfortable for lounging and conversation. Although we show the Arabella as a three piece sectional with two accent pillows, other configurations are available. Please contact us for two-tone pricing using more than one fabric, or to explore a different configuration. Two accent pillows are included with this configuration as shown. 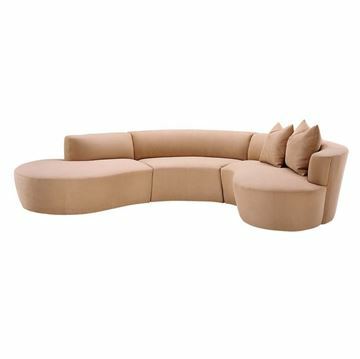 The Chiara Sectional Sofa Left is a wonderfully balanced and very comfortable design by Wilhelm Bolinth. As with all W. Schillig designs, the overall back rest and comfort level of the Chiara is superb, best described as plush and supportive. Both arms feature gradual ratchet adjustments. This allows you to find the perfect angle for stretching out to read a book, watch a movie, or better yet, take a short cat nap. The Chiara is a modular design, and dozens of other custom configurations are available. Contact us for more information if you'd like to explore more. 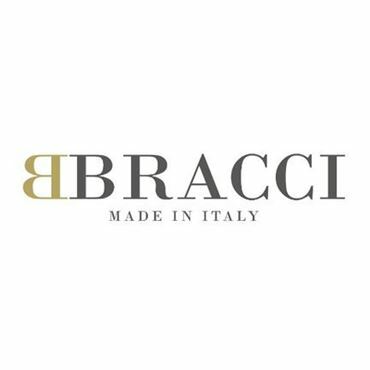 The Chiara is available in many different leathers and with three different leg styles. All leathers are 100% top grain! The Chiara Sectional Sofa Right is a wonderfully balanced and very comfortable design by Wilhelm Bolinth. As with all W. Schillig designs, the overall back rest and comfort level of the Chiara is superb, best described as plush and supportive. Both arms feature gradual ratchet adjustments. This allows you to find the perfect angle for stretching out to read a book, watch a movie, or better yet, take a short cat nap. The Chiara is a modular design, and dozens of other custom configurations are available. Contact us for more information if you'd like to explore more. The Chiara is available in many different leathers and with three different leg styles. All leathers are 100% top grain! 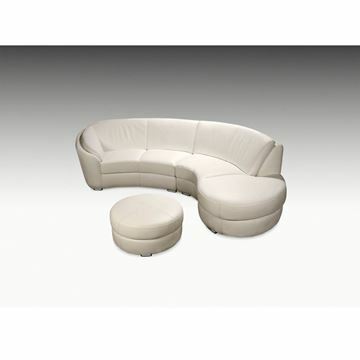 The San Tropez Sectional with Right Side Bumper End. The San Tropez personifies clean lines, and balanced proportions. The polished aluminum legs, and a wonderfully comfortable tufted pillow-top seat give the overall design a wonderfully modern and balanced look. All of these design features by talented designer Fillmore Harty define this Pinnacle Award winning design. The plush floating back construction maximizes comfort and creates a style that is as beautiful from the back as it is from the front. San Tropez is finished all the way around – giving you a piece that can easily command the center of a room. And it's available in a variety of premium top grain leathers. Seat height is 19". 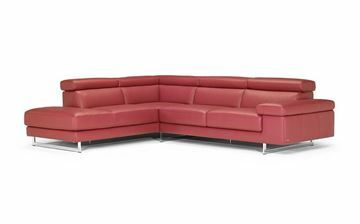 Contact us to explore alternate sectional configurations. The San Tropez Sofa Chaise Left features clean lines, polished aluminum legs, and a wonderfully comfortable tufted pillow-top seat. All of these design features by talented designer Fillmore Harty define this Pinnacle Award winning design. The plush floating back construction maximizes comfort and creates a style that is as beautiful from the back as it is from the front. San Tropez is finished all the way around – giving you a piece that can easily command the center of a room. And it's available in a wonderful variety of premium top grain leathers. Seat height is 19". The San Tropez Sofa Chaise Right features clean lines, polished aluminum legs, and a wonderfully comfortable tufted pillow-top seat. All of these design features by talented designer Fillmore Harty define this Pinnacle Award winning design. The plush floating back construction maximizes comfort and creates a style that is as beautiful from the back as it is from the front. San Tropez is finished all the way around – giving you a piece that can easily command the center of a room. And it's available in a wonderful variety of premium top grain leathers. Seat height is 19". The Primanti Right Arm Sectional, by W. Schillig. Ratcheted arm rest makes finding a comfortable position easy. The Primanti is a smart sectional defined by lean, architectural lines accented by button-less tufts and double needle tailoring. The sculpted back, tufted on both the front side and back side, makes a graceful and stylish statement when the piece is floated in a room away from walls. Other configurations, larger or smaller sectionals, sofas, and love seats, are available upon request by contacting us. The Alexis Sectional by Precedent Furniture, configured as a sofa left chaise. The Alexis is a plush sitting soft contemporary design. The medium width track arm showcases exceptionally well with the brushed metal legs. The Alexis Sectional is available in a wide variety of fabrics, making it a simple and enjoyable task to find the perfect fit your room. The cushions are plush and very comfortable. There are several options for the cushion filler, which greatly influences the look and comfort style of the finished sectional. The cushions are not attached to the frame, making it easy to flip and rotate for maximum longevity. Please see below for all the available choices, and please call or email us for help making the perfect configuration. We love to help, and we'll gladly do so as much, or as little as you want us to. The Alexis Sectional by Precedent Furniture. The Alexis is a plush sitting soft contemporary design. The medium width track arm showcases exceptionally well with the brushed metal legs. The Alexis Sectional is available in a wide variety of fabrics, making it a simple and enjoyable task to find the perfect fit your room. The cushions are plush and very comfortable. There are several options for the cushion filler, which greatly influences the look and comfort style of the finished sectional. The cushions are not attached to the frame, making it easy to flip and rotate for maximum longevity. Please see below for all the available choices, and please call or email us for help making the perfect configuration. We love to help, and we'll gladly do so as much, or as little as you want us to. 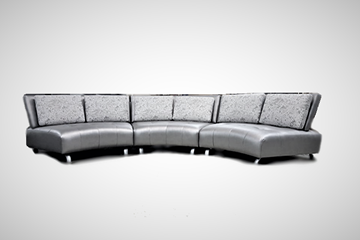 The Jake Sectional by Precedent Furniture. This transitional design is available in a wide variety of fabrics. And thanks to a great variety of pieces, we're able to create arrangements custom sized to fit your room. The cushions are plush and very comfortable. We can also have them finished in feather down for a more casual yet very comfortable sit. Please see below for all the available choices, and please call or email us for help making the perfect configuration. We love to help, and we'll gladly do so as much, or as little as you want us to. The Artek Curved Sectional by Lazar. The Artek sectional is a stunning design, blending elements of modern and mid-century modern design. Fabric applications can create a look ranging from ultra modern to soft contemporary. The Artek is a stunning sectional all on it's own, even more so as a pair facing each other to make a grand conversational setting. Available in a wide variety of fabrics, the Artek can suite many different styles of decor. Please scroll down for all the details. To view all of Lazar's fabrics, please click on the LAZAR FABRIC CHOICES tab below. And please feel free to call or visit us if you'd like us to assist in the creative process of designing this piece for your room. 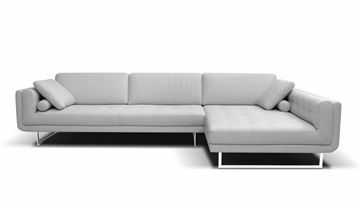 The Artek Sectional by Lazar, curved with a left bumper end piece. The Artek sectional is a stunning design, blending elements of modern and mid-century modern design. 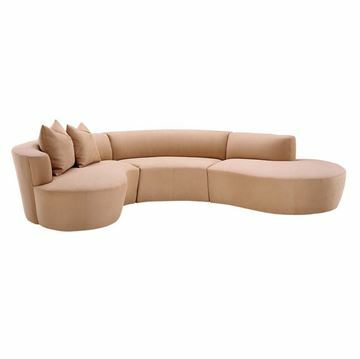 A great sectional all on it's own, and just as wonderful as a pair facing each other to make a conversational setting. Available in a wide variety of fabrics, the Artek can suite many different styles of decor. Please scroll down for all the details. To view all of Lazar's fabrics, please click on the LAZAR FABRIC CHOICES tab below. 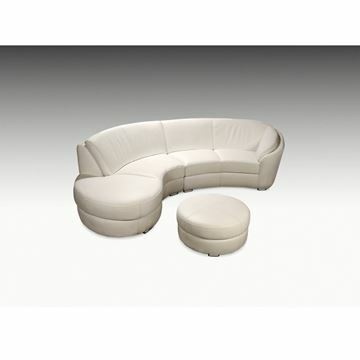 The Artek Sectional by Lazar, curved with a right bumper end piece. The Artek sectional is a stunning design, blending elements of modern and mid-century modern design. 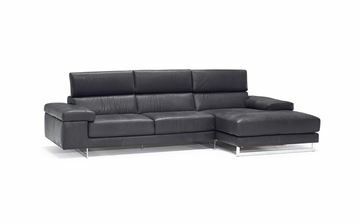 A great sectional all on it's own, and just as wonderful as a pair facing each other to make a conversational setting. Available in a wide variety of fabrics, the Artek can suite many different styles of decor. Please scroll down for all the details. To view all of Lazar's fabrics, please click on the LAZAR FABRIC CHOICES tab below. 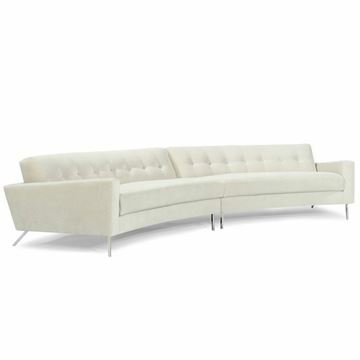 The Kelvin Giormani Rusco Right Bumper End Sectional by Planum. The curved armrest and backrest almost feel like they hug you and make for a perfectly comfortable sitting experience. Polished stainless steel legs adorn both sectional and matching ottoman. 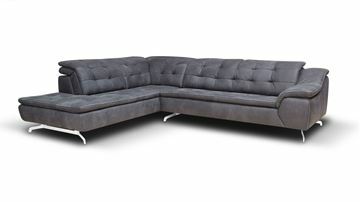 This two piece sectional is crafted entirely out of premium ingredients. Shown here in stock in all top grain leather Orvieto 9470 White, and also in stock in leather Orvieto 9409. The matching cocktail ottoman fits perfectly within the curvature of the sectional. Pull it up to the sectional and you create a perfect chaise style arrangement for stretching out and relaxing. Please see below for more details. 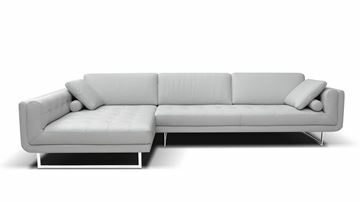 The Kelvin Giormani Rusco Left Bumper End Sectional by Planum. The curved armrest and backrest almost feel like they hug you and make for a perfectly comfortable sitting experience. Polished stainless steel legs adorn both sectional and matching ottoman. This two piece sectional is crafted entirely out of premium ingredients. Shown here in stock in all top grain leather Orvieto 9470 White, and also in stock in leather Orvieto 9409. The matching cocktail ottoman fits perfectly within the curvature of the sectional. Pull it up to the sectional and you create a perfect chaise style arrangement for stretching out and relaxing. Please see below for more details.